Pressure tested, water resistant to 60 PSI. Available with Maxim DS18S20 sensor. The STP temperature probe is designed for general-purpose, wide temperature range applications. It is constructed of 304 Stainless Steel, making it both durable and water resistant to 60 PSI. The STP has good chemical resistance properties to acids, alkalis, ketones, esters, aliphatics, aromatics, and outdoor exposure. While the steel probe is waterproof to 60 PSI, the sensor should not be submerged above the steel probe as the sensor is not waterproof at the cable’s point of entry into the steel tube. For applications requiring complete submersion, please refer to our model OW-TEMP-B3-12xA or OW-TEMP-S3-12x (rugged) temperature probe. 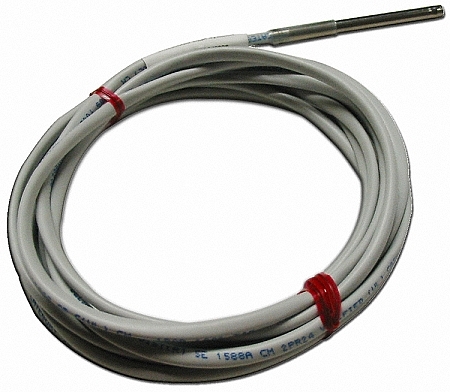 The STP temperature probe is available with a DS18S20 1-Wire temperature sensor embedded into the probe. The STP probe is manufactured using a special process which insures the internal sensor is thermally coupled to the steel tube wall; this helps insure rapid sensor response to changing conditions. The STP temperature probes are directly compatible with all Embedded Data Systems and Maxim 1-Wire bus masters, our OneSix server software, and the freely available TMEX drivers. For complete documentation on the embedded DS18S20 sensors, please refer to manufacturer’s spec sheets available at http://www.maxim-ic.com/.